Last summer a long-time student and friend of mine, Lily Strassberg, was an intern at our company. She was also helping out with some parrots at a pet store in Boston and wanted me to go see her favorite birds. So one day after work we went together. The store had a lot of psittacines, all right, some of them out of their cages and very tame. Nice. The owner was perhaps more of a hobbyist than a bird seller. There were also some pretty little finches of various sorts. I have an aviary in my dining room. A canary used to live in it; it was a nice bird, friendly with a huge loud song, but he died of a tumor. For a long time the cage has been empty, which has been a good thing, too. However, I thought that maybe it would be nice to have a little life in the house again. 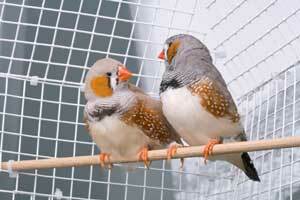 I saw a cage full of female zebra finches. They were pretty little things, brown with black-and-white-striped tails, orange beaks, and orange on the cheeks. The birds were very small, about half the size of ordinary English sparrows—and not very expensive. I said I'd take four. Underneath these birds, in a little cage on the floor, I spotted a single zebra finch. Why was that one all alone? These little birds are very social, and pine in solitude. Lily explained, "He just has one eye, so no one would want him." "I want him!" I said. He was gaudier in pattern than the females, and his eye was all healed—not a problem really. I persuaded the shop to give me the male for free, in return for my giving him a good home. I took the birds home and turned the females loose. They kind of helicoptered around, not used to the bigger space and not used to landing on branches instead of plastic bars. I put the male in next. He flew to a branch. In five seconds one of the females landed beside him and cuddled right up: "Hi, good lookin'." She didn't care how many eyes he had as long as he had an eye on her, which he apparently did. I had a little straw nest in the cage, up near the top, more for decoration than anything else; it was much too small to have interested the canary. The happy couple moved right in! I gave them some dried grass and cotton strips and they went to work improving the nest. Every night they slept in it, cuddled up side by side—sweet! And then, didn't she lay eggs, tiny eggs the size of my little fingernail. I'm 5'3" and the nest was too high to see into, but I dragged a chair over to take a look, just once. The female sat on them for weeks and weeks and nothing happened. Oh good, they're sterile. Suits me. My son Mike was visiting from California, and he is 6'2". So Mike, inspecting the aviary, looked down into the nest: "Hey, did you know there are four chicks in here?" Oh no! I certainly didn't. I dragged the chair over and he was right—a little pile of pin-feathered sleeping babies, each about the size of a thimble. The babies grew feathers, and got bigger, and began to crowd the nest. A week or so later, one of them fell out of the nest and scooted around on the floor of the aviary. It could scoot right out of the gaps between floor and walls of the cage! I tried this and that, and ended up sculpting a sort of aluminum foil barricade around the base. While I was doing that, the Dad bird landed beside the chick on the floor. "Yap yap yap, feed me feed me," says the chick, crouching, gaping, and fluttering its wings. These birds are obligate seed eaters but babies can't shuck seeds, so the parents—I learn by watching—shuck and swallow a bunch of seeds and then approach the baby, urp up a mouthful, and stuff some into the chick. Then they do it again. With four chicks? That translates to fifty times a day, maybe. By the next day all four were fledged—out of the nest, down on the floor, bravely trying to fly up to the lowest branches, and yapping at their parents. "Feed ME, no feed ME." Dad was on the floor of the aviary, facing a row of four unpleasantly yappy chicks and cocking his head to look at them with his one good eye. He was urping and stuffing, pausing to recover, urping and stuffing the next mouth, methodically down the row. When they were all quiet briefly, he went to the seed dish to tank up again. The mother bird fed the babies, too, but not as assiduously; the other female birds watched from above: "Glad I don't have kids!" After several days of following Dad around and clambering into the seed bowl and out again—and eyeing but not eating seeds I have scattered around—Yay, one of them began to peck for itself. In three days they all learned. The parents watched: "Whew, thought they'd never figure that out." The chicks learned to fly. They discovered the bird bath and took highly enthusiastic baths, one after the other, splattering water all over. They grew more feathers and began to look like birds instead of dust mops. Up in the rafters or down on the floor they stuck very close together, a little gang of siblings. They had, of course, an attentive Mom and Dad and also three spinster aunts who sometimes groomed them and sometimes pecked them if they get too close. I took the nest out, put it through the dishwasher, and stowed it out of sight in a drawer. Let's not get any more big ideas here, birds. Now I have nine birds. Nine birds is too many. Nine little mouths shuck nine times more seeds than the canary ever ate. Feathers and feather dust and droppings and debris add up to a huge mess in all directions under the cage. And, Dad is occupying himself by tearing up the floor papers and trying to make a new nest in a fork in the branches that really won't hold anything. Place a piece of paper; balance it; watch it fall; go down to the floor; pick it up; fly up and try again. The local pet store tells me that Newtonville Pets, a few miles away, sells birds and will accept gifts of birds such as these. I'll have to call them one of these days. The chicks should leave. Mom and Dad know them all and will perhaps miss them—but I KNOW they will also want to go right back to raising another batch. Zebra finches are a popular laboratory bird, one reason being that they breed incessantly, like mice, and you can never be in short supply. I open the shade of the window behind the aviary. The first time I did that, all five of the original birds flew to the branch on the window side and sat in a silent row, staring, transfixed by their first glimpse of the world. Raised in bird rooms, they had never seen the sky, the trees, the outdoors. Now it is a familiar sight, so I give them something new to think about by putting seed in the driveway, under their window. The local sparrows find that new resource inside of 24 hours. And indeed the finch tribe finds that sight interesting. So I don't know. I'm tired of the mess under the cage, and some people are allergic to the feather dust, which is beginning to coat the dining room table. I'm not sure how to catch the babies and transport them. On the other hand, it was a lot of fun watching them grow and fledge and pester their folks and learn to eat and all that. Maybe I'll call Newtonville Pets and put the nest back in. Maybe. Tomorrow.